The project used focus groups and surveys to explore consumers’ attitudes to FCEVs and related topics, including costs, performance (technical and environmental), safety, and refuelling habits. The results showed that consumers were receptive to FCEVs, especially in terms of vehicle performance and refuelling time. Gaining an improved understanding of potential buyer’s attitudes to Fuel Cell Electric Vehicles (FCEVs) was a central focus of the initial phase of the project. UK H2Mobility has undertaken the most significant and detailed research yet into consumer views on FCEVs, building a valuable understanding of how the market for hydrogen powered vehicles could develop. It canvassed opinions through focus groups, interviews and a quantitative survey of 2,000 people who had recently bought, or were looking to buy a new or nearly new car, learning the key concerns people have about costs, technical and environmental performance, safety and refuelling procedures. The studies have helped the project categorise different types of consumer, notably those who make environmental performance a priority and who want to be the first to take advantage of new technologies – the early adopters. Understanding the perceived and real issues that will impact on the uptake of FCEVs helped UK H2Mobility shape its strategy to overcome the barriers to growth. As the vehicle costs become more competitive and the refuelling infrastructure develops, consumer uptake is calculated to increase more quickly. In the UK H2Mobility roadmap, by 2030 there will be 1.6m FCEVs in the UK with annual sales of more than 300,000. The cost of FCEVs in the early years of their market introduction and the initial limited availability of refuelling stations emerged as the principal consumer concerns that will impact on vehicle purchase decisions. UK H2Mobility gained intelligence about how far motorists would be prepared to drive to a Hydrogen Refuelling Station (HRS) and how sales are likely to build as vehicle costs become more competitive with those of diesel vehicles, both in terms of purchase and ongoing running costs. The research into consumer decision making allowed projections of FCEV uptake to be made, with a central case showing that early adopters could generate around 10,000 annual FCEV sales by 2020. 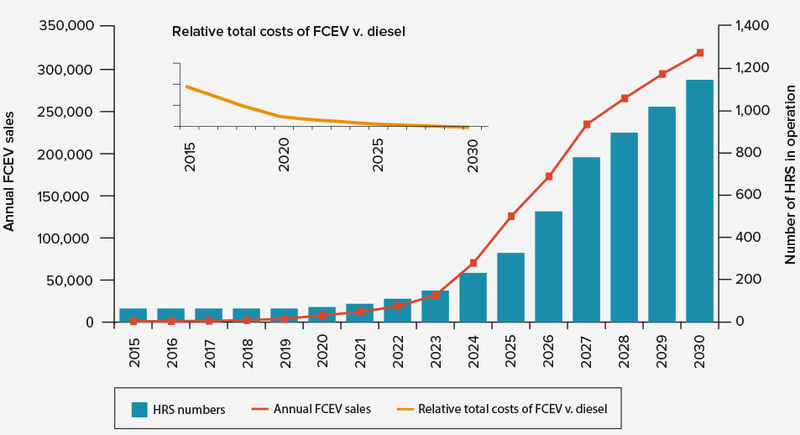 As vehicle costs become more competitive with diesel-powered models and the refuelling infrastructure develops, FCEV uptake is expected to rise more quickly, as shown in Figure 1 below. The UK H2Mobility roadmap projects annual UK sales of more than 300,000 by 2030, by which time 1.6 million FCEVs will be on the road.